Silver followed spot gold as it too responded to renewed investor appetite for risk and a weaker US Dollar. 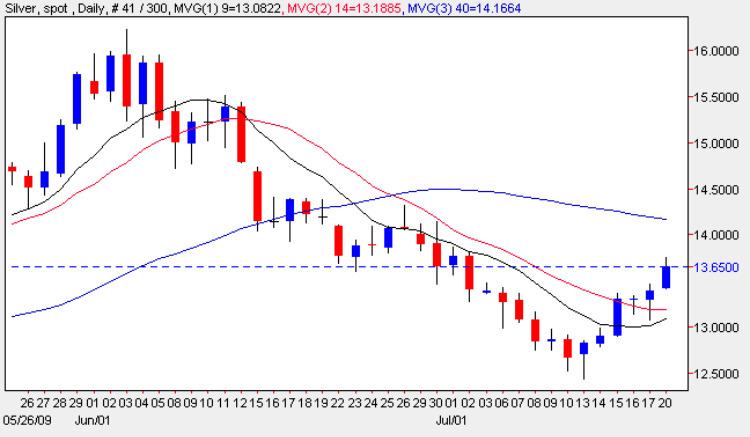 Spot silver gained a total of 15 cents on Friday reading an inter day high of $13.467 per ounce ending an excellent week for silver prices on the daily silver chart, with five straight day of gains, and reversing the downwards trend of the previous week. From a technical perspective Friday’s candle ended the trading session with a narrow body, but a deep lower wick, nearly always suggestive of a move higher and which has indeed been the case in trading so far today and continuing with Friday’s positive sentiment into the new trading week. It is also interesting to note that the low of the session found good support from the 9 day and 14 day moving averages, which is always a positive signal, suggesting that these technical indicators are supporting the upwards move. However, before we become too optimistic, silver prices have a long way to go before recovering their levels of early June, and the first barrier to any further progress is the significant resistance now in place at the $14 per ounce price level, which may provide stiff opposition to a move higher. Only a break and hold above this level, coupled with a breach of the 40 day moving average will provide us with further positive signals and confirm that the decline of the last few weeks has now been consigned to history. In the short term we need to see a breach of the interim resistance at the $13.75 level, and should this be achieved then $14 becomes the next likley target for the price of silver in the medium term. The short term trend is bullish, the medium term trend is sideways while the long term trend is bullish.